I have been spotted with a spot in the lung: what can it mean? If you have been having symptoms such as cough, expectoration with blood and/or chest pain when breathing, it is likely that you have already seen the doctor, have requested a chest x-ray and have detected spots in the lungs. First of all you should know that not all the spots in the lungs are blood. It is normal that you feel worried about this situation and, although cancer is the cause of most concern, most of the time these lesions or spots appear, they are due to other reasons. In the following article we will talk about the spots in the lungs: causes and symptoms. Pneumonia: An infectious disease that occurs in one or both lungs, usually of bacterial origin. The injuries on the radiography represent the congested alveoli of secretions. The image shows an irregular white spot, commonly located at the base of the lung. Tuberculosis: Chronic and progressive infection, frequent in people with a weakened immune system such as HIV. Tuberculosis can cause spots in the whitish lungs observable in the X-ray. It also presents with weight loss and cough with expectoration of more than 15 days of evolution, characteristic symptomatology. Granuloma: There are nothing more than masses of immune cells formed as a mechanism of self-defense when the body is faced with foreign substances. There are diseases that are characterized by being granulomatous, for example: tuberculosis, histoplasmosis and coccidioidomycosis. This pathology represents a medical emergency, so if you notice these symptoms you should visit the doctor. Pulmonary edema represents the second cause of lesions in the lungs when a doctor evaluates a chest x-ray, they are also seen as lightly blurred spots in the pulmonary surroundings, the frequent symptom of this disease is shortness of breath or dyspnea. At the time of visualizing a lesion on the lungs, should not be overlooked pulmonary fibrosis in which the lung heals and therefore this tissue will not receive adequate oxygen. Although its causes are unknown, smoking tobacco is the most common cause. A spot on the lung: what can it mean? Hemartoma: These are disorganized tissues that can reach large sizes similar to tumors but called malformation. They can develop anywhere in the body standing out in the lungs. Lipoma: These are benign fatty tissue tumors, are usually localized in the skin but can appear anywhere or organ with fatty tissue, where the lungs are included. The risk factor for the appearance of pulmonary lipoma highlights tobacco smoke. It is evident in the X-ray as a well-defined rounded mass. On the other hand, lung cancer is the most serious reason related to lung spots, it is frequent in heavy smokers, and in fact it turns out to be the disease with the highest mortality worldwide. The most dangerous aspect of this disease is that its course is asymptomatic or silent, however, when it is diagnosed, it already has characteristic advanced symptoms. 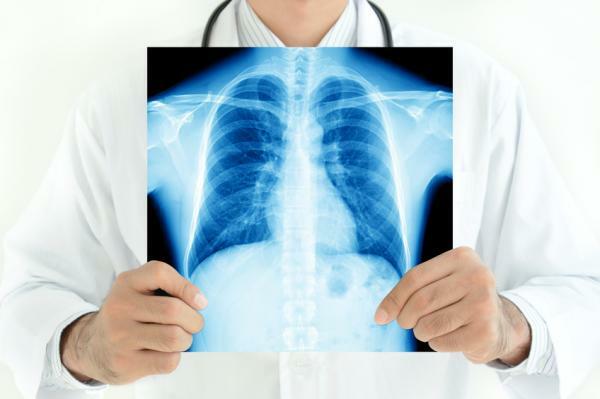 The chest radiography shows nodules of small or large size, depending on the stage of lung cancer, which are observed as a white spot on the radiography. Dyspnea or shortness of breath or difficulty to repair. Pain in the chest when breathing. Detected a spot on my lung: What should I do? By exercising to have resistant lungs, walking or swimming is recommended. Quitting smoking, most of the lung diseases where the spots visualized in the TACs are prevalent are caused by tobacco. Reducing fat consumption by allowing clean lungs. It is also recommended to detoxify the lungs for 3 days based on fruits and vegetables and ingesting plenty of water, decreasing the consumption of coffee sugar and processed foods. The use of the carrot strengthens the mucous membranes of the lung. On the other hand, radish is a natural antibiotic can be used in infusions and salads. Garlic is a natural product that allows you to breathe better by eating 1 garlic on an empty stomach daily. It is recommended to use valuations with eucalyptus to clean the respiratory system. Practice breathing exercises, vital to enjoy healthy lung. Inspiring slowly across the nose counting up to 5 mentally and exhaling for the mouth at the same time. Repeat this exercise 5 times a day. Obviously the causes are multiple but the main trigger is smoking, however, it is important that before being alarmed by the spots in the lungs go to a pulmonologist specialist who will request the complementary test to determine the proper diagnosis and the treatment you need.